When an engine runs, it creates massive amount of heat. The internal combustion temperatures often reach as high as 4500 degrees. The cooling system must prevent the engine from overheating—even if the out door temperature is 110, degrees in the shade. Without proper cooling, the engine would eventually burn and score its pistons, and warp or burn its valves and cylinder heads. Without its cooling system, the engine block would become a red-hot mass of molten metal. And excessive heat also can break down engine oil to the point where it fails to lubricate properly. It’s the job of the cooling system to maintain the engine at its most efficient operating temperature, at all engine speeds and under all engine loads/driving conditions. Paradoxically, the cooling system also keeps your engine warm. On a cold day, some engine parts might never warm to operating temperature without the cooling system. A cold engine is inefficient. Moreover, combustion gases leaking past the piston rings condense in the crank case, where they form acids and sludge that can be harmful to vital engine parts. Heat from the cooling system helps vaporize and eliminate those blow-by gases. Here is how a typical liquid cooling system works: A belt-driven centrifugal water pump circulates coolant—water plus antifreeze—through a water jacket that surrounds the engine’s combustion chambers. The coolant absorbs heat from the engine and then is pumped through the radiator. When the car is moving, outside air rushes through the grille and past the radiator cooling tubes and fins, drawing heat from the coolant. When the engine is idling or the car is moving slowly, a fan, powered by the engine through the fan belt/timing belt or electric fan assembly, provides a sufficient flow of air. Sometimes, the fan has a shroud to draw air through the radiator. A lot of people forget that it is air that actually does the cooling of the engine. The modern cooling system is designed to incorporates air flow dynamics in a more critical manner. The engine and its components are designed in a more temperature sensitive manner. Any changes to the air flow can create large changes to coolant temperatures. So, make sure that all the baffles and shrouds that was design for the vehicle are in place and unobstructed. A temperature-sensitive valve or thermostat, placed in the coolant outlet passage, controls the flow of engine coolant, provides fast engine warm-up and regulates coolant temperatures. When the coolant is cold, the valve remains closed. Because this prevents coolant from circulating through the radiator, the coolant in the engine circulates within the block and warms quickly. 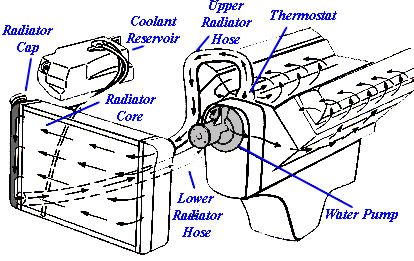 As coolant temperature rises, the valve opens to allow coolant flow into the radiator, where the heat is dissipated through the radiator walls to the surrounding air.. Even when the thermostat is closed, the engine still needs swift circulation of coolant through its water jacket to prevent hot spots — small areas that get hotter than the surrounding metal. Coolant circulation is then passed through a bypass, sometimes a short length of hose from the thermostat housing to the water pump intake. 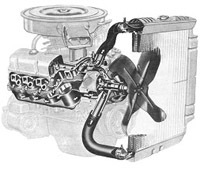 Many modern engines has a built in bypass in the block assembly. When the car heater is turned on, it also works as a bypass circuit, tapping hot coolant from the top of the water jacket and feeding it back to the intake side of the water pump. The heater uses engine coolant heat to warm the incoming air; that is why it does not work well until the engine warms up. Air cooled engines uses a set of baffles to draw heat from the external part of the engine to warm the passenger compartment. As coolant is heated, it expands in volume. The use of a coolant recovery system permits this fluid expansion to overflow into the recovery reservoir. When the engine cools, the coolant contracts in volume and vacuum draws any that has overflowed into the bottle or reservoir back into the radiator. This assures that the radiator will not boil over, and so remain filled to capacity at all times, maintaining the specified level of cooling efficiency.